Before we dig into turning goals into habits, let’s remind ourselves about the process we have gone through thus far. 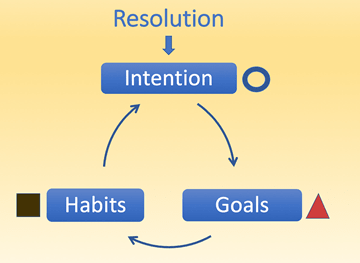 In part 1 of “From Resolution to Reality” we talked about the difference between resolution, intention and goals. We set an intention which gave us the a big birds’ eye view of what we want to achieve. In part 2, we got fiery and turned the intentions into SMART goals so that they are measurable and achievable. Now we need to take it one step further in order to anchor it into our lives. We need to turn goals into tiny habits and to-dos. Why? Let’s find out. What is a tiny habit and why do we need them? By definition a habit is something we do automatically aka without thinking. Automatic actions are a good thing. They help us get many things done on a daily basis without expending too much energy. For example, brushing your teeth and tying your shoes is a classic example of a habit. You don’t think about whether you should do it or not. You also don’t think about the how it needs to be done. You just do it. New habits need to be small enough to adopt. Since they are not habits yet they initially require some energy. We need to figure out exactly what, how and why. If the habit is too big we get overwhelmed and may not do it. Say you want to lose those 20 lbs and decided to start exercising. Going to the gym 5x/week for 90 min each may just be a bit out of your reach. But if chose to exercise only 10 min daily, that might be more attainable. Make your habit so tiny you can’t resist it. Some goals may require you to establish daily or weekly habits around them. Others may require a one time action only. Some may require both. As a general rule, habits can be written into our calendar as sensible action step, goals cannot. E.g. I could write into my calendar, to meditate daily for 20 min and block that time out on a daily basis. I could not write into my calendar “increase my daily self care from a 3 to a 6.” or “lose 20 lbs in 90 days”. Or, I should say, I could write it in but I would not be able to act upon it. Setting goals is important as they they give us a clear end point in the future we are working towards. However, focusing solely on the end-goal often is too daunting, makes us too masculine and goal driven and does not honor the process of getting there. So we break them down into tiny habits and one time action steps. 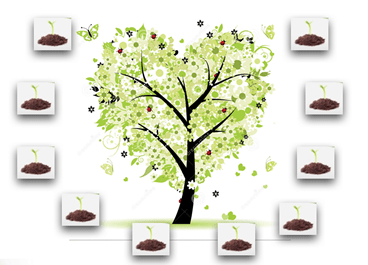 It is like planting seeds around an outcome that will help us to nourish that desired outcome. Then we focus our attention on cultivating those seeds. Every once in a while (daily, weekly, monthly) we take a birds eye view at all the seeds we have cultivated to see how the forest is growing. Something like this. Let’s look at an example to get clearer. Say your smart goal is “to lose 20 lbs in 90 days”. You need to break that down into tiny habits and action steps that will have an impact on your weight. You would have to ask yourself, what do people do on a regular, habitual basis that makes them have a normal weight? They probably exercise more, eat less, eat healthier, do yoga, go hiking, start with a glass of hot water in the morning, drink hot water throughout the day, poop daily, get abundant rest etc. After you brainstormed those ideas, pick one or two you are going to take action on. Drinking hot water first thing in the morning, for many people, is a doable first step. So you go plant that seed by doing this on a daily basis. Once you have reasonably established that habit, look at the next. Say it is exercise and you decide to move for 10 minutes daily. Plant that seed by putting it into your calendar. By focusing on planting seeds your focus goes away from the main goal and towards simply living like a person who has a healthy weight. The goal falls into place automatically over time. All you need to do is nourish the seeds you have planted. Planting seeds creates the environment for your goals to thrive. One of the things people often struggle with is how to remember to do the habit they set themselves out to do. I get it, been there, struggled with that too. I just forget or I don’t even start because I wasn’t clear where in the sequence of my day it could fit in. Luckily there is a solution from habit changing science that has been well researched by Stanford’s smart heads like BJ Fogg. What they say is this: In order for a habit to be set in motion, you need a trigger. This is an easy one. Say the habit you want to establish is going to bed earlier, more precisely by 9 pm. You could set your alarm for 8:30 pm (time trigger) which will give you 30 minutes to do your bedtime routine and turn your lights out by 9 pm. You can anchor a new habit to another habit you already have. The “old’ habit needs to be something you do without fail. For example, getting up in the morning is something you probably do without fail every day. You could anchor your new habit of ‘meditating for 10 min daily’ to that prior action. Say you wanted to also anchor “drinking hot water” in the morning onto that habit, then you could have a sequence of getting up – drinking hot water – meditating. The getting up is the prior action to drinking hot water, the hot water is the prior action to meditating. Different places in our home trigger different behaviors. You will have a different behavior in your office versus your living room, versus your meditation corner. The way we set up our environment makes a huge difference. Location can be a nice trigger. For example, say you want to become more calm and present and you have identified that you need to breathe more deeply. You could say every time you return home (location trigger) from work, the first thing you do is to take three deep breaths. Other people can be a good trigger as well. Say you have been struggling with depression and a downtrodden way of being and you want to adopt the habit of thinking positively. You could say that “every time I pass my boss in the hallway, I say one thing I am grateful for. This of course only works if you see your boss on a regular basis and not just once every blue moon. The last trigger, which is emotional state, often triggers bad habits in an effort to drown them out. When we feel sad we grab for the chocolate, when we are anxious we reach for the wine, when we are bored we do some unnecessary online shopping. In other words, the sadness is the trigger for eating chocolate, the anxiety for the wine, the boredom for online shopping. However, we could turn this upside down and use emotional states to trigger positive habits instead. e.g. instead of eating chocolate when we are sad we could take a bath or massage our feet. That will give us a similar reward of being soothed but doesn’t have the nasty side effect of gaining weight. Emotional states can be a bit harder to utilize as triggers as they require us to be aware of our emotions when they arise. It takes some practice to get that awareness and it takes some courage to admit them but if you are aware and courageous they are great triggers. Puhhhh…..now we totally got into the nitty gritty day to day stuff. Habits put our intentions into action. Arriving at this level of manifestation often makes me feel accomplished but also dense and heavy. Nothing wrong with that but it is easy to get stuck here and forget your motivation. Why am I doing all this again? Why am I exercising like a mad person? Why am I writing daily for 2 hours? It is time to circle back to your intention to make sure you stay inspired. Do that now. Take a moment and tap back into your vision. Ultimately, it’s only a thought away.